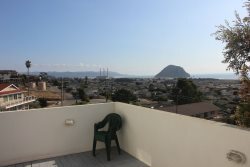 This pet friendly, 3 Bedroom, 2.5 Bath home is located in North Morro Bay and is just minutes to the beach. Featuring a large outdoor patio boasting great ocean views this home is perfect for a quick weekend getaway. Downstairs you will find a two garage, along with 2 full bedrooms and a shared bath. The first bedroom features a queen size bed along with a TV. The second bedroom has bunk beds with a Full size futon bed on the bottom and a single bed on the top. This room also features sliding glass doors opening to a fully fenced backyard. You will also find a full bath with a shower/tub downstairs. Upstairs you walk into a large open living area, with a full size sofa, multiple chairs and a gas fireplace to relax around. You will also find an open kitchen/dining area with an elegant table for four and open breakfast bar with seating for three. You will also find a large master suite with queen size bed, walk in closet and private full bath featuring a tub/shower. Off the living room upstairs you will find a large outdoor patio with a gas BBQ, table and chairs for 4 along with amazing ocean views! This home also offers a 1/2 bath off the upstairs living area, washer and dryer, cable TV, WIFI and every other modern luxury you could desire. WIFI Internet, Fully Stocked Kitchen, Clean Linens, Cable TV(4), Ocean View Patio, BBQ.